It’s double blog post Monday at Gazette665… Find the civilian words from earlier in the day here. Note: This primary source excerpt is significantly longer than our usual features, but if shortened it any further would lose its historical importance. ….When the fog rose, about ten o’clock in the morning [of November 25th], Sherman attempted to carry the summit of the [Missionary] Ridge but was repulsed; again he tried it but was again repulsed, still again he tried it and was repulsed… Sherman, after terrible fighting, had been repulsed in three successive efforts to crush the enemy’s right on the top of the Ridge, and an order came for our Division to move up the river to his support. We started. The enemy could see us from the top of the Ridge, and quickly understood (or thought they did) our design, so they commenced shelling us, as our long line of 20 regiments filed along, but we moved along until we came to where a thin strip of woodland intervened between us and the Ridge. Sheridan’s Division followed us and did the same. The enemy supposed of course that we were moving on up the river to the support of Sherman, but we were not; we halted and formed line of battle in that strip of woodland, facing Mission Ridge. This, I confess, staggered me; I couldn’t understand it; it looked as though we were going to assault the Ridge, and try to carry it by storm, lined and ribbed as it was with rifle pits, and its topmost verge crowded with rebel lines, and at least 40 cannon in our immediate front frowning down on us; we never could live a moment in the open spaces of 600 yards between the strip of woods in which we were formed and the line of rifle pits at the base of the mountain, exposed as we would be to the fire of the 40 cannon massed and from five to eight hundred feet immediately above us, also to the infantry fire from the rifle pits. I rode down along the line of our Division and there I found Woods Division formed on our right and facing the Ridge just as we were; I rode on and came to Sheridan’s Division formed on Woods right and facing the same. Here was line of veteran troops nearly two miles long, all facing Mission Ridge, and out of sight of the enemy. The purpose at once became plain to me, and I hurried back to my own Division, and on asking Gen. —— he replied: “When 6 guns are fired in rapid succession from Fort Wood, the line advances to storm the heights and carried the Ridge if possible. Take that order to Col. —- and tell him to move forward rapidly when he hears the signal.” I communicated the order at one and that was the last I saw of the brigade commander, for he was killed just as he reached the summit of the Ridge. A few moment elapse, it is about half past three o’clock P.M., when suddenly, 6 guns are rapidly fired from Fort Wood. “Forward”! rings out along that long line of men, and forward they go, through the strip of woods, we reach the open space, say 600 yards, between the edge of the woods and the rifle pits at the foot of the Ridge. “Charge”! is shouted wildly from hundreds of throats, and with a yell such as that valley never heard before, the three Divisions (60 regiments) rushed forward; the rebels are silent a moment, but then the batteries on top of the Ridge, open all at once, and the very heavens above us seemed to be rent asunder; shells go screaming over our heads, bursting above and behind us, but they hurt nobody and the men don’t notice them; about midway of the open space a shell bursts directly over my head, and so near as to make my horse frantic and almost unmanageable; he plunges and bursts breast strap and girth and off I tumble with the saddle between my legs. My orderly catches my horse at once, throws the blanket and saddle on him, gives me a “leg lift” and I am mounted again, without a girth, but I hold on with my knees and catch up with our madcaps at the first rifle pits, over these we got to the second line of pits, over thee we go, some of the rebels lying down to be run over, other scrambling up the hill which is becoming too steep for horses, and the General and staff are forced to abandon the direct ascent at about the second line of rifle pits; the long line of men reach the steepest part of the mountain, and they must crawl up the best way they can 150 feet more before they reach the summit, and when they do reach it, can they hold it? The rebels are there in thousands, behind breastworks, ready to hurl our brave boys back as they reach their works. 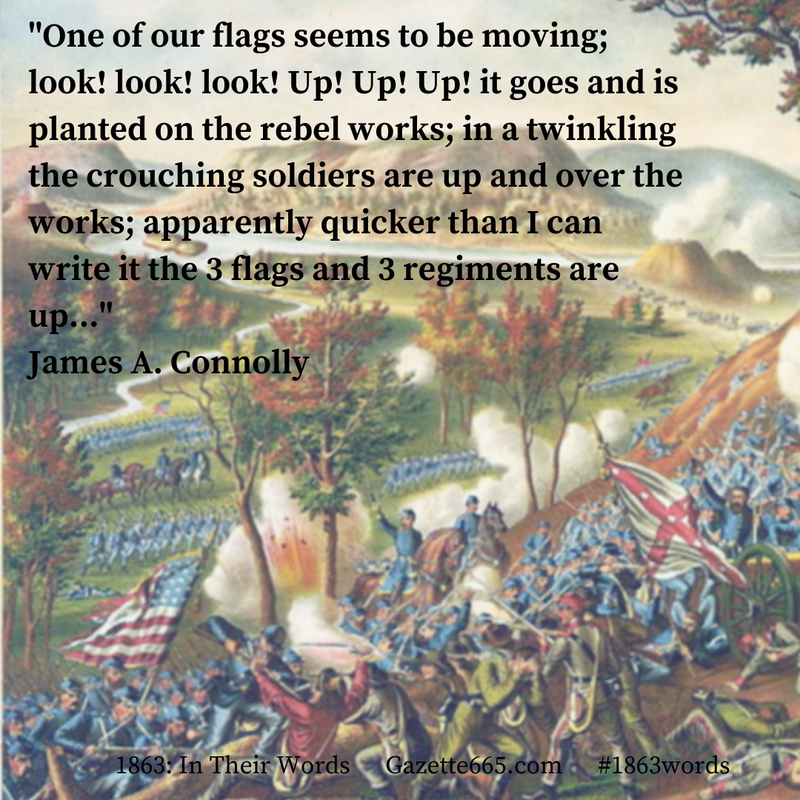 Once flag bearer, on hands and knees, is seen away in advance of the whole line; he crawls and climbs toward a rebel flag he sees waving above him, he gets within a few feet of it and hides behind a fallen log while he waves his flag defiantly until it almost touches the rebel flag; his regiment follows him as fast as it can; in a few moments another flag bearer gets just as near the summit at another point, and his regiment soon gets to him, but these two regiments dare not go the next twenty feet or they would be annihilated, so they crouch there and are safe from the rebels above them, who would have to rise up, to fire down at them, and so expose themselves to the fire of our fellows who are climbing up the mountain. The suspense is greater, if possible, than that which which we viewed the storming of Lookout. If we can gain that Ridge; if we can scale those breastworks, the rebel army is routed, everything is lost for them, but if we cannot scale the works few of us will get down this mountain side and back to the shelter of the woods. But a third flag and regiment reaches the other tow; all eyes are turned there; the men away above us look like great ants crawling up, crouching on the outside of the rebel breastworks. One of our flags seems to be moving; look! look! look! Up! Up! Up! it goes and is planted on the rebel works; in a twinkling the crouching soldiers are up and over the works; apparently quicker than I can write it the 3 flags and 3 regiments are up, the close fighting is terrific; other flags go up and over at different points along the mountain top – the batteries have ceased, for friend and foe are mixed in a surging mass; in a few moments the flags of the 60 Yankee regiments float along Mission Ridge from one end to the other, the enemy are plunging down the Eastern slope of the Ridge and our men in hot pursuit, but darkness comes too soon and the pursuit must cease; we got back to the summit of the Ridge and there behold our trophies – dead and wounded rebels under our feet by hundreds, cannon by scores scattered up and down the Ridge with yelling soldiers astraddle them, rebel flags lying around in profusion, and soldiers and officers completely and frantically drunk with excitement. Four hours more of daylight, after we gained that Ridge would not have left two whole pieces of Bragg’s army together…. James A. Connolly to his wife Mary Dunn Connolly, December 7, 1863. 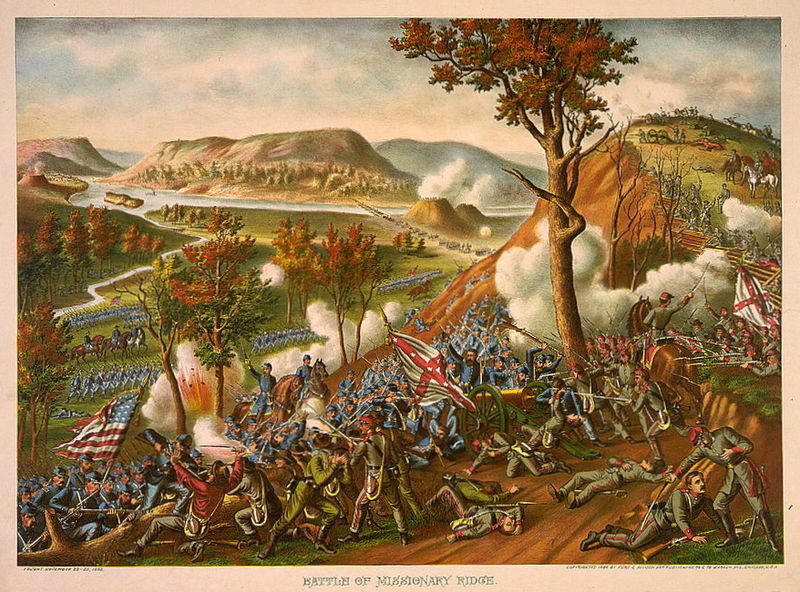 On November 25, 1863 – the day after the Battle of Lookout Mountain – the Battle of Missionary Ridge occurred. General Ulysses S. Grant commanded the Union army and Braxton Bragg commanded the Confederate forces. After the Union success at Lookout Mountain, Missionary Ridge remained in Confederate control. General William T. Sherman with units from the Union Army of the Tennessee attempted to take the high mountain at its northern end but was repulsed by Confederates on the heights. As the day wore on, Grant ordered General George Henry Thomas and his Army of the Cumberland to make an advance. As described in the letter, the troops quickly overran the lower Confederate rifle pits and headed up the steep slopes. After fierce fighting, the Union troops gained the crest and pushed the Confederates into a fast retreat. Confederates lost over 8,000 casualties in the battle while the attack Union soldiers suffered 5,824 losses at the Battle of Missionary Ridge. A post war illustration of the Battle of Missionary Ridge. The Confederates and even some of the Union commanders firmly believed that Missionary Ridge was uncapturable. This resulted in less organization and support than the Union troops needed for complete success. Still, the Confederates retreated from Missionary Ridge and headed for Georgia. Union troops pursued and several fights occurred as the Confederates retreated south. The Union now possessed Chattanooga and broke up the siege at Knoxville at the beginning of December. The Southerners would not be able to make another serious attempt to regain Tennessee during the war. The Civil War in the western theater was changing and 1864 would be a different type of conflict in new regions and states. Major James A. Connolly served in the 123rd Illinois Infantry and was on General Absalom Baird’s staff during the battles around Chattanooga. Connolly wrote a short letter to his wife on November 26, immediately after the battle. About ten days later, he wrote a lengthy letter describing each day of the battle and including this detailed account of the attack on Missionary Ridge. His account is one of the most dramatic of the battle and the section read in its entirety gives us a glimpse of the heroism of the Union soldiers during this fight. In many ways, this attack on Missionary Ridge was a “soldiers fight” and without the proper support or belief of success from their top commanders, it can be seen as a moment of triumph for individuals pulling together to accomplish a tremendous goal.